Renowned 18th century British explorer and navigator Captain James Cook wrote in his journals that “Ambition leads me not only farther than any other man has been before me, but as far as I think it possible for man to go.” One cannot deny that Cook’s first voyage to the South Pacific and Australia was historic, and almost exactly 200 years later the crew of Apollo 15 set off on a momentous mission of their own to Earth’s only natural satellite: the Moon. Surely Cook would have deemed such a voyage impossible. And yet desire, drive and of course some friendly competition made lunar exploration a reality, two centuries on from Cook’s expeditions on the HMS Endeavour. It was that ambition that Cook spoke of which led a young man from Jackson, Michigan to an eventual flight around the Moon as part of that Apollo 15 crew. Al Worden spent three days alone orbiting our lifeless neighbour while his two crewmates explored an area of Mare Imbrium (the Sea of Rains), 28 degrees north of the lunar equator, on the surface below. The name of the Command Module he piloted during that time was of course Endeavour, in honour of their aforementioned fellow explorer who had sailed very different seas in a time long before Saturn V rockets and lunar modules. Growing up in 1930s America, Worden could never have imagined the paths he would take, and the places he would see, in his own lifetime. “There wasn’t such a thing as an astronaut when I was a kid. There were television shows that had ‘spacey’ type themes like Buck Rogers, but that was it.” Worden earned a scholarship to the esteemed Princeton University, but a scholastic records check found he hadn’t studied Latin and so that opportunity was taken away from him. Having chosen the Air Force after graduation from West Point, Worden went on to receive flight training at various bases in Texas and Florida. A Master’s degree in Astronautical/Aeronautical Engineering with Instrumentation Engineering at the University of Michigan in 1963 preceded stints as a test pilot at the Empire Test Pilot’s School (then situated in Farnborough, England) and then as an instructor at the Aerospace Research Pilot’s School at Edwards Air Force Base in California. Worden remembers his time flying in England particularly fondly, having decided to live with his family in a bungalow five miles south of Aldershot as opposed to staying holed up in an American base. Worden was selected, along with fellow distinguished Air Force pilots Dave Scott (Commander) and Jim Irwin (Lunar Module Pilot) to form the crew of Apollo 15, the fourth manned lunar landing, launched on July 26th, 1971. When asked if he would have traded his mission for any others, Worden maintains “Well, maybe Apollo 11, that would’ve been nice. But no, I think we had the best mission of them all. We did the most science and concentrated on that.” He points out that “there were a lot of firsts on our flight that made it a really great flight to be on.” He’s right – Apollo 15 was the first of three ‘J’ missions which concentrated more on science than any previous flights. The mission included the first Scientific Instrument Module (SIM) bay flown and operated on an Apollo flight, the longest lunar surface stay time (Scott and Irwin’s lunar module Falcon remained on the surface for almost 67 hours), the first use of the lunar roving vehicle (or ‘Rover’) to travel further on the Moon’s surface than ever before, as well as the first sub satellite launched in lunar orbit. Many of the Apollo astronauts seem somewhat divided on the matter of whether we should go back to the Moon before sending people on to Mars. Worden is certain however that a return to the Moon is a waste of time. “There’s one thing that it would be very nice to go back to the Moon for. If we could put a big observatory on the surface of the backside of the Moon, that would be absolutely unbelievable. Other than that the Moon is no good to us for anything.” Even in terms of a launch platform to Mars, the Florida resident believes the International Space Station (ISS) would be a much wiser option than the lunar surface. In terms of whether we’ll ever find any other living species in the universe, Worden seems convinced. “If you talk about whether there is intelligent life out there, the answer is absolutely, resoundingly yes. It’s deductive reasoning really.” With 300 billion stars in our Milky Way Galaxy alone, it is hard to argue with him. Worden’s autobiography, Falling to Earth, was released in 2011 and made it to the top 12 of the LA Times Bestseller list. 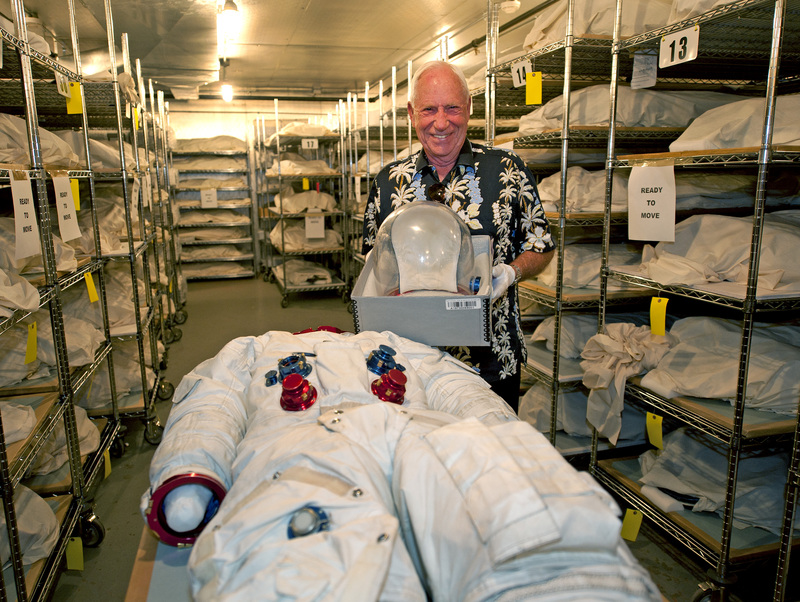 Written with Manchester-born space historian, author and current Director of Education at the San Diego Air and Space Museum, Francis French, the book is a fascinating insight into the thoughts and experiences of an Apollo astronaut. Worden’s recent visit to the Irish west coast was organised by Limerick native Paul Ryan. A hugely successful few days included a lecture at Limerick IT on September 16th, before concluding with a dinner event at the Pavilion in the University of Limerick the following day. The 82-year-old has no intention of slowing down his schedule just yet. “I enjoy doing this, I enjoy talking to people. It keeps my feet on the ground.” Having flown a half-million mile round trip to the Moon over 43 years ago, terra firma must feel that bit more precious. 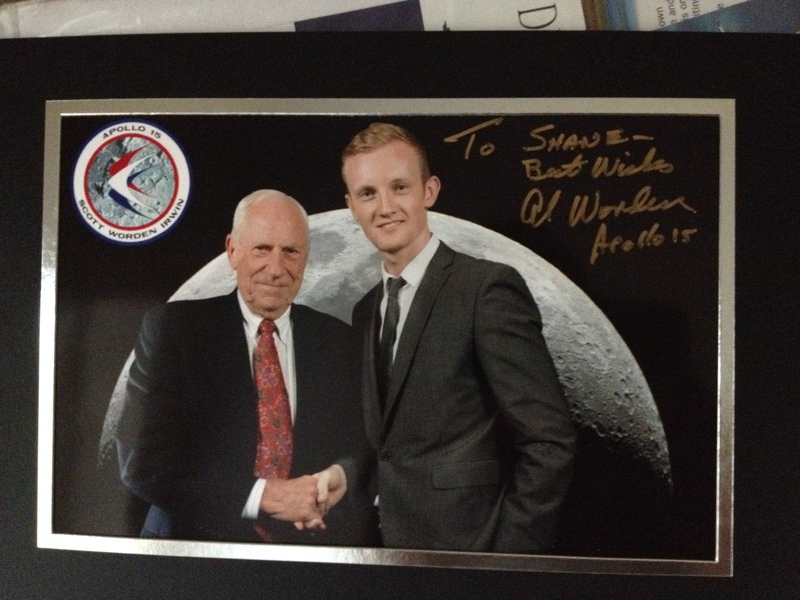 Al Worden – the boy from Michigan who took a trip to the Moon. The above interview was exclusively conducted at the dinner with Al Worden event held at the Pavilion on the University of Limerick campus on September 17th, 2014.